Made by the same company that supplies the South Korean military, these .50 BMG cartridges from PMC deliver the long-range accuracy and power expected of the "fifty cal." Packaged in a sturdy, reusable 100-round ammo can, this ammunition fires a 660 grain full metal jacket bullet at over 3,000 feet per second. 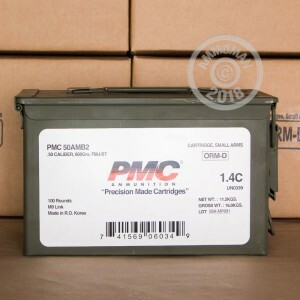 This ammo is manufactured using non-corrosive Boxer primers and brass cases. 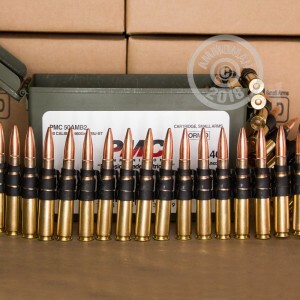 If the cost of shooting .50 BMG is getting you down, pick up this bulk priced can from AmmoMan.com and get FREE shipping (as with any order over $99).